Galway-based sales management software company OnePageCRM will create 12 new jobs, as part of a €575,000 investment programme supported by Enterprise Ireland and other investors. The new hires will be in engineering roles for web and mobile technology, digital marketing and customer support. 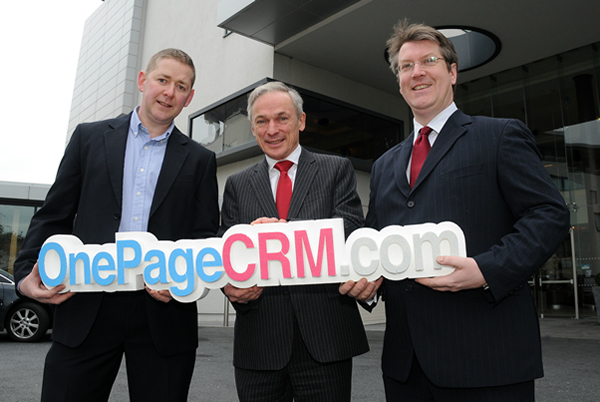 Pictured left to right are: Michael FitzGerald, founder and CEO of OnePageCRM, Minister for Jobs, Enterprise and Innovation Richard Bruton, TD and Brian O’Malley, Enterprise Ireland. OnePageCRM is a cloud-based sales management application for SMEs with a worldwide proven method to greatly boost sales. Specifically built for small business, its unique design makes it extremely effective with minimal data entry and is as easy to use as email. OnePageCRM is part of the wave of new cloud-based applications for business, where team collaboration and mobile access is to the fore. Securely hosted on Amazon servers, it uses the same encryption as online banking. ‘Larger CRM systems work well at enterprise level, but not in SMEs whose managers are busy juggling the multiple tasks of running their business. Enterprise CRM is overkill for their needs’. With an international market, the company has successfully focused on export sales from the beginning. Michael FitzGerald added: ‘The beauty of distributing a sales-related product is that it can be sold globally without the need of complex configuration. Sales in SMEs is the same the world over – engage, build trust and stay organised. OnePageCRM excels at this process. The application, being used by companies around the world, proves its value every day by helping salespeople get things done’. Welcoming the announcement Barry Egan, Enterprise Ireland Regional Director West Region, said: ‘OnePageCRM is exactly the type of young and innovative company that Enterprise Ireland is keen to support. They have worked with both the local Galway Enterprise Board and now Enterprise Ireland to build an ambitious company with a very strong product offering. We look forward to continue working with them as they grow and develop their business on international markets’. 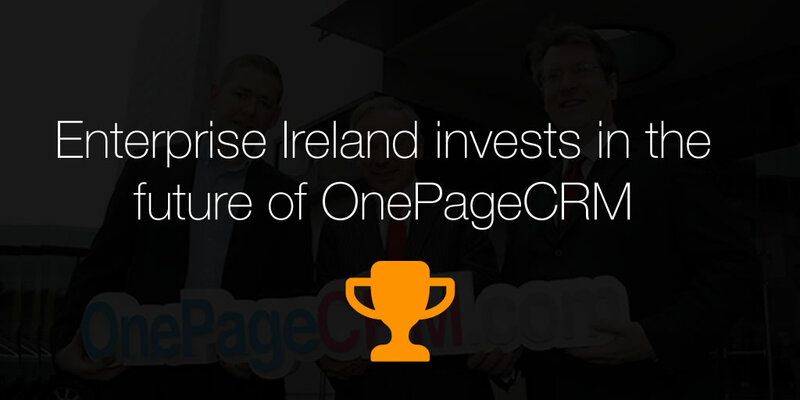 An Enterprise Ireland backed High Potential Start-Up company, OnePageCRM has used modern internet technologies and an advanced user experience to stand shoulder-to-shoulder with global players. This is a disruptive business model, where the distribution is a direct sale of a low-cost product. The company was founded by Michael FitzGerald in 2010. An engineering graduate from NUI Galway, Michael has been mentored by the best in Silicon Valley via Enterprise Ireland’s iGAP program that brought in the people such as Eric Ries of Lean Startup and Sean Ellis who helped the now-famed Dropbox become viral. The company is headquartered in Galway, with offices in Poland and USA. Says FitzGerald: ‘Galway has been good to us with close proximity to the University for graduates and expertise. It’s also a city that people like to live in, so attracting key staff to Galway has not been a problem. Our most recent hire came from a passionate OnePageCRM user, who believed in the product so much, asked to fly into Ireland and meet the team. Four weeks later, he moved to Galway with his wife and children to work with OnePageCRM’. Well done Mic. Let me know if you find yourself in Dublin at a loose end and I’ll buy you a coffee for a chat. Well done Michael, this is great news for OnePage… onwards and upwards!